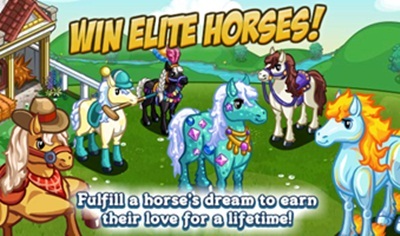 Fulfill orders to receive this new batch of rare horses in FarmVille Elite Horses. This building is more like a combination of the Lab and the Dairy. The idea is players will be fulfilling orders this time a variety of rare horse and in order to fulfill this order players will be needing materials. 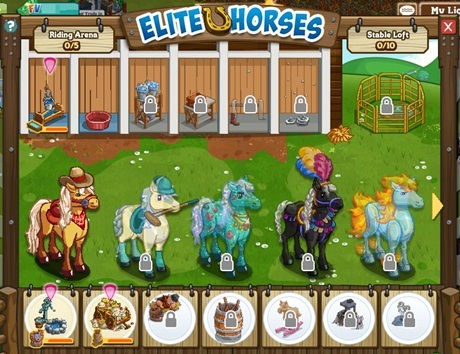 The materials or parts can then be obtain from harvesting Stations and also crafting it inside the Elite Horse building. This setup would be like the Dairy or Yarn Barn. After successfully fulfilling the order an Elite Horse will be won. This will make me give up FV – you will not be able to store everything you need to get the 5th horse (and above) without expansions that will cost you either tons of time or cash… Simply not worth it! Unable to make fifth horse because you can only have 5 items in inventory without paying money to expand or craft with crops no one grows. This is going no where! Very annoying… got the first 4 then you need to make room for the items. Takes like 24 bushels to make each item and you need 30 items. With all the quests how can you even get to this… Maybe if you played 24/7 UGH!!! Same problem.. out of my 200+ neighbors, ONE is growing the crops needed. So… can get 3 bushels a day. Need 24 bushels total (for the fence anyway. It will take me 8 days just to get the bushels for one fence.. and I need 10? I’m trying to grow the crops needed myself and just going to SLOWLY craft one thing til I have them all. But still, I’ve already harvested one large field worth of crops and of course didn’t get enough bushels. I don’t see this being something I’m going to continue. We’ll see if it gets better/easier to gather bushels. If not, I’m all set. On a different thread someone said that if you keep crafting the starter horses that you get expansion parts as reward. So I’ve crafted the first horse 2x and gotten 2 parts for the riding arena each time. A little boring, time consuming and whatnot, but something to do while playing around on the farms. We’ll see if it keeps giving me parts I need. RubyRed, that’s good to know about getting parts that way. By “starter horses” I assume you mean the first horses, not that there’s one named started. I didn’t realize we could re-do them once completed. Sorry yeah I was referring to the first horse. That’s the easiest to do. Oh and apparently zynga has lowered both the amount of materials needed to make the parts as well as the parts needed to expand. I discovered that when I went to check to see what I needed. After the first 4 horses many times, yesterday I got enough parts to expand my Stable Loft capacity from 10 to 15. My Riding Arena is still on 5, but I am half way on the parts needed to expand. anyone any idea if the first 4 horses give the same material for expansion every time you make them ? or is it random ? As far as I can tell it’s random. For me, the parts I received expanded my stable loft before I received enough parts to expand my riding arena. The first expansions took days to get enough parts, but after that I quickly received enough parts to expand Stable to 25 and Arena to 20. Only now on the last horse, the Fairy Show Pegacorn, am I having to intentional increase the capacity of my arena. Once I’d managed to get enough capacity to complete the fifth horse both storage areas expanded to 15 capacity, presumably automatically. I certainly didn’t have enough parts to do it, and those parts that I did have remained to be used later. too late, and I thought I had calculated that 25 would suffice. Not, 26 ….. stupid, especially as I am almost finished – not ! well, enjoy, all of you ! FarmVille Task Copyright © 2019.